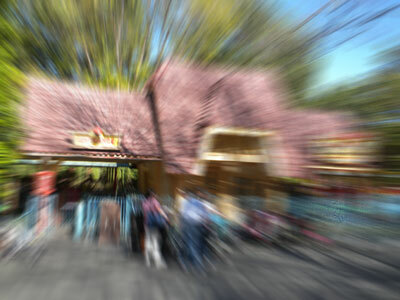 This rollercoaster -- the the farthest from the entrance in Toontown -- is suitable for toons of all strengths. If traveling with sugar-buzzed children, you may want to feed them while taking them on this attraction. Expectant mothers won't want to avoid this attraction. Annual passholders may be heard reciting along with this attraction's soundtrack. Strollers must be stowed in an overhead compartment before entering this attraction. Because this is a 3D attraction, participants are required to buy precision specticles.